Our laundry man had no clean clothes. We went to the pool at the Pavillion again, and to the Java Art Cafe. We had dinner at our hotel. We cruised around some more and went to yoga, and we had dinner at a French restaurant. Steak! More cruising around, yoga, working, until Glaser arrived in the evening! We went to dinner at Romdeng, run by an NGO that trains street kids to have jobs in the restaurant industry. Today we did a full day of touring. We started at S-21, the notorious prison under the Khmer Rouge. Originally a high school, it is now a genocide museum. We had a really interesting tour. After a mango shake break at BP, we drove out to the Killing Fields, where the thousands of prisoners from S-21 were buried (of the 20,000 prisoners, only 7 survived). It was a bare bones site, but still very affecting. (See posts, Cambodia's Dark Past and Khmer Rouge to Khmer Riche). After a late lunch we went to the Russian Market where we shopped for knock-off clothes and souvenirs. We had dinner at The 240 while we tried to get some work done. We hired a taxi ($35) to drive us the 3 hours to Kep where we were staying with Glaser at the beautiful Veranda Natural Resort in a room “for a couple with small child.” We spent the afternoon at the hotel pool and then went into town for dinner at Kimly – amaaazing fresh crab in Kampot green pepper sauce. 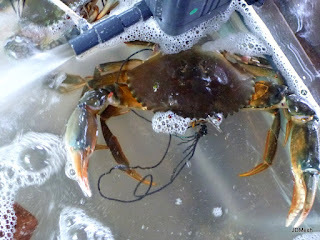 The restaurant was right on the water, and the crabs were kept in the ocean about 10 feet out. So fresh. (See post, Kep: Simply Crabulous). We did an all-day trip to Rabbit Island, hiring a rickety boat to drive us out from the Kep pier. It was peaceful and deserted, even if the ocean was somewhat dirty and it was incredibly windy. Dave and Lauren got a massage while I lounged in a hammock. We tried to go back to Kimly that night but they were closed!!! So sad. Instead we had shakes at Toucan Bar and then dinner at the place next to Kimly, which was good but no Kimly. Taking a break from the hiking for meditation. We went for a hike in the morning – we had planned on a super early start, but thanks to a torrential rainstorm we were “forced” to go back to sleep for an hour. The hike was underwhelming. We drove to Kampot where we checked into the peaceful (and rustic) Les Manguieres. We hung around in the afternoon by the river, played with the dogs, tried to finish our work, and then went into town for dinner at Rikitikitavi. back to the hotel in a rickshaw. Today Lauren and I took a tour to Bokor Hill Station. (See post, Fog, Faded Glory...) Dave was smart and declined. While Dave lounged by the river, Lauren and I took a minibus to the back of an over-stuffed pickup truck to a sweaty jungle trek (witl threats of leeches) to the foggiest mountaintop I’ve ever seen. The ruins were just okay. Eerie and totally dilapidated. We got back to Kampot at 2:30 and had to wait until 4 for our “sunset boat cruise” which would drop us off at our hotel (sunset, by the way, is at like 6:30). We had iced coffees at a German bakery and happened to run into Dave. We took the boat tour back to the hotel and had some wine and dinner there while small French and Cambodian children ran around. We fell asleep to the sounds of the Kampot Music Festival which was going on down the river (and was sold out, so we couldn’t get tickets), and the rain. It was a loooong travel day. 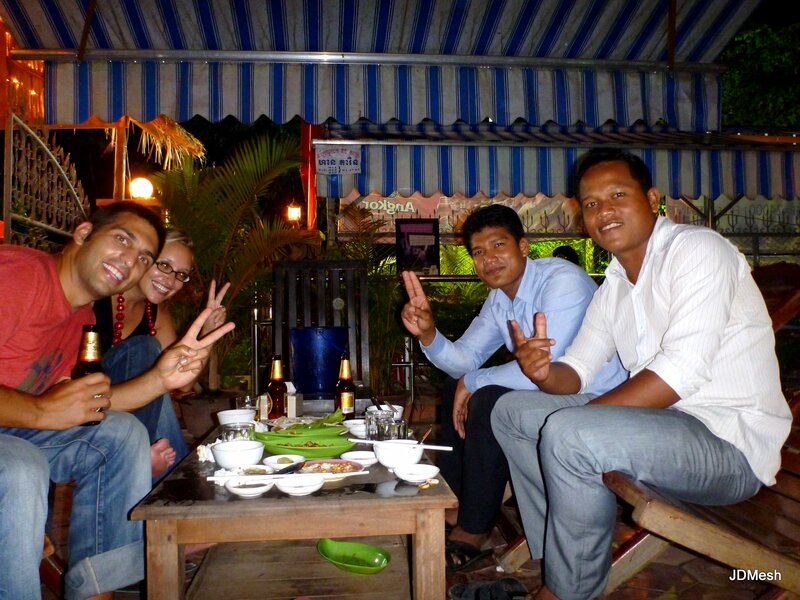 We took a 3 hour taxi to Phnom Penh, and then a 7 hour bus to Siem Reap, that stopped every 1 ½ hours or so for food. Glaser really got the full JDMesh travel experience. 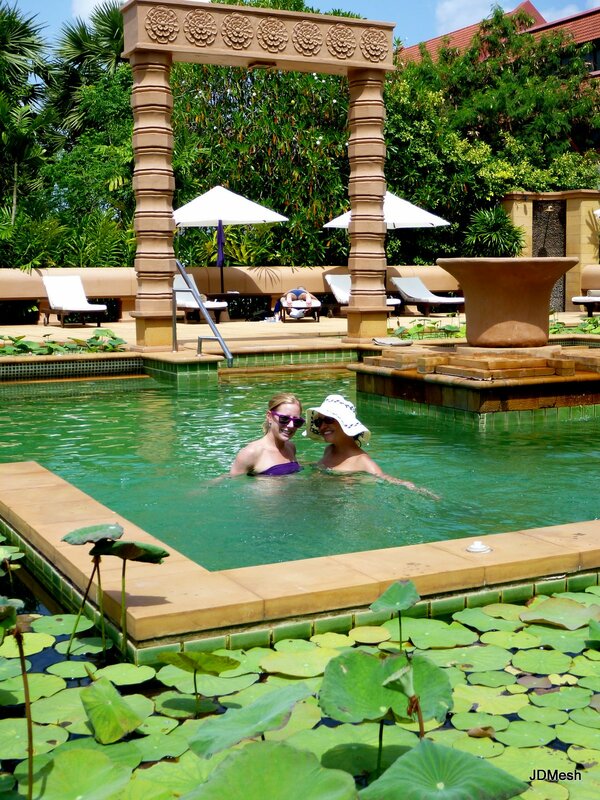 We stayed at the excellent and highly recommended Villa Siem Reap, and had dinner there after getting $10 massages. We did a full day of touring today, starting at Angkor Wat, then (after Blue Pumpkin lunch, obvs) seeing Angkor Thom (including Bayon, Baphuon, Phimeanakas, Terrace of the Elephants and Terrace of the Leper King) and finally the really cool and jungly Ta Prohm. (See posts, Angkor Wat, Angkor Thom and Ta Prohm). A ckconut pit stop was much needed and then we went to another temple to watch the sunset (which didn’t happen because it was so overcast). After showering we went into town where Lauren and I shopped around while Dave went to a travel agent to buy some incredibly cheap tickets to Vientiane ($130 and all we could find online was over $300!). Then we ate totally disappointing street market food and then Glaser had a fish spa – the kind where the fish eat your dead skin. She was the only one brave enough to do it. Another full day of touring. This time we rented a car instead of a tuk tuk and drove out to Beng Malea, about an hour and a half away. It was really cool – trees growing everywhere, covered in moss, totally wild. A policeman took it upon himself to guide us around the site and we often left the path for some fun rock climbing and scrambling. (See post, Beng Mealea). Afterwards we drove through some villages on stilts and then took a boat tour of the floating villages that are all around Tonle Sap Lake (the largest lake in SE Asia). We saw some Cambodian villages but also a large Vietnamese one. The people move around depending on the water in the Lake – the depth can range by a huge amount. (See post, Waterworld). On the way back to town we stopped at a roadside stand where ladies were selling bamboo cones filled with sweet sticky rice and black beans. A 50 meter stretch of road was lined with these stalls, and this is apparently the only place you can buy this particular dish. Delicious. Back in town, Lauren and I shopped some more and then met Dave at Temple Bar to see a traditional Khmer dance show. It was kind of boring. We had mediocre food at Angkor Palm restaurant and then headed to the Night Market. We bought some of the recycled fish food and concrete bag purses – we had tried and failed earlier to find the fair trade place, turns out they changed locations. We needed a relaxing day, so after a delicious breakfast at the cafe at Hotel de la Paix (bagel and lox!!) Lauren and I set out to find the fair trade bag shop – finally, success! (Note to self: next time, check google maps right away). 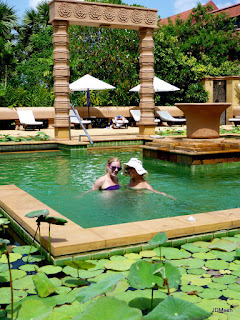 Then we all headed over to Le Meridian and spent the afternoon by the pool. Finally it was time for Lauren to leave for the airport - good thing she left a lot of time since when she got there she found out that her flight was canceled and she was booked on a flight that left 45 minutes earlier! Dave and I headed into town for internet and mango shakes at the Blue Pumpkin, then internet and a glass of wine at Aha, and then picked up pizza to go at Il Forno. We took it back to our room and watched the bootleg DVD of 127 Hours that we had bought in Chiang Mai. Spoiler: he cuts of his arm and it is gross. With new friends at the beer garden. Dave woke up super early a rode a bike up to Angkor Wat for sunrise. It was overcast, though, and there wasn’t much of a sunrise. Once again, I proved that declining a sunrise in order to sleep is almost always the right move. We relaxed around the hotel in the morning and then hopped in a tuk tuk. After a quick lunch at the BP at Angkor Wat, we went to Preah Khan, a temple in the style of Ta Prohm. It was realy cool – very pretty with the pink sandstone covered in green moss, with the vibrant green grass glistening in the rain. 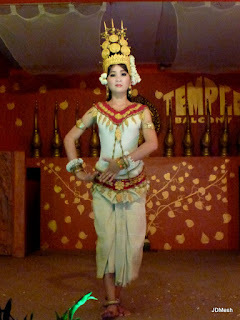 Then we went to Banteay Samre, whigh was more in the Angkor Wat sytle. It was totally empty except for us, three loud Australian guys, and two adorable children who asked us for one dollar. (See post, Preah Khan and Banteay Samre). We didn’t leave there until after 5 so we were too late to go up on the famous sunset hill (which was okay since there was no sunset). We collected our luggage and checked back into The Villa where we scored ourselves a free upgrade (because our reservation was screwed up) to a deluxe room. It was much bigger than our last room but the shower was much colder, which in my opinion is an overall lose. After dinner at The Villa we were picked up by Menh and Phillipe (his English name, can’t remember his Cambodian name), two bellmen we had met at the Merids, for a night on the town. They took us to a beer garden, were we drank Angkor Beer and snacked on grilled beef with pepper dipping sauce, and some sort of tiny spicy clams. Then we rode off to a nightclub (where we were required to check our camera!) It was really fun, a bunch of their friends met us and we all hung out and danced. I was definitely the tallest woman in there. They played club music the whole time except for one interesting interlude when they played traditional Khmer music and everyone danced slowly in a circle. The highlight of my evening was when a Cambodian guy danced up to me and asked me for how many years I had been in Cambodia. When I said “three weeks” he said, "wow, your traditional dancing is really good." I continue to maintain that he was dead serious and not mocking me. Will this package make it? Always a roll of the dice. We spent the morning at the Cafe at Hotel de la Paix and then went to the post office to ship some stuff back home. In the afternoon we went to a free English language school where we played with the younger kids and chatted with the older kids so they could practice their English. Students come here after their normal public school ends to learn and practice English and use the library and other resources. The kids were adorable. (See post, Cambodian Kids on Camera). We had pho at Soup Dragon for dinner and then went to Rogue to buy some music.